Information: Ancient and contemporary Greek culture is so vast that choosing this topic today is truly intriguing. Understandably, a lecture isn't going to make any us better dancers but hopefully, I can shed some meaning as to why we prance around in a circle and what it is about Greek dance that gives us joy. First, let me take a moment to tell how I came to love Greek dance, and why I so strongly identify with it. Like many Greek families, mine celebrated all our events with dance. My greatest joy as a child was looking forward to two seasons: spring and summer. In springtime, when sounds of "protomayia" echo everywhere the first of May, all of Greece is dressed in a petticoat of red poppies. There are picnics and rituals of gathering wild flowers that date back to ancient times. Some of the choicest days in my early life were the late winter Karnavalia celebrations before Lent, and the grandest holiday of all  Easter! As a child, I spent summertime in my parents' village of Litohoron nestled in the foothills of Mount Olympus. Every weekend, various chapels in the nearby hills celebrated a saint's day with a feast. People gathered under the shade trees preparing foods, as the icy waters from the melting snow of Olympus quenched our summer thirst and cooled watermelons in the nearby running brooks. My uncles played "gaidas" (bagpipes) and "klarina" (clarinets) setting the pace for all to dance. I wish I had realized then that dance was my destiny; I would have paid closer attention to what I was dancing! For me, dance has always been a way to communicate when words failed. I came to America as a teenager, and before I learned to speak English, I learned the "American" dances. Friday nights, kids were dancing to big bands in the parks of Brooklyn and before I knew it, I was doing the boogie woogie and the Lindy hop. I was even approached to dance on Broadway but my parents didn't understand that kind of "monkey business" and forbade it. Later, when I joined the Coast Guard and was sent to the South Pacific, the only way I knew to communicate with the natives was by dancing with them. They loved showing me their moves. We couldn't speak to one another but through dance we expressed our joy and feelings. As a sailor in San Francisco, after losing all my money in a crap game, I browsed along Market Street until I heard the familiar eerie sounds of a clarinet coming from a Greek restaurant. Homesick and yearning for the taste of anything with olive oil, I strode in and ordered a familiar dinner. While wondering how I was going to cover the check, a nice-looking family with two gorgeous daughters caught my eye. As the music began they started to dance. I lept onto the dance floor and joined the line. In no time, the girls pushed me to lead the dance, and soon we were laughing and dancing as if we knew each other all our lives. Their father generously took care of my bill and many years later when I returned to California, I met these same two sisters again. This time they were married with families of their own. We were dancing at a Greek gathering. When I asked them to teach me a particular step they were doing, they laughingly replied that they had learned these very steps from me years ago in that San Francisco restaurant. That's how dance is disseminated  we transmit, we share, we make dance our own and pass it on. While studying theater at New York University, I enrolled in professional dance classes, secretly of course; I could hardly explain this to my parents. Later, when I was dancing in Broadway musicals, I discovered a feeling of emptiness and a sudden urge to return to Greece. I had just met Eva Palmer Sikelianos, the wife of Greece's celebrated poet. She saw me dancing at a gathering, and whispered in my ear, "Thanasi, esy prepei na horeveis, min kytas pouthena allou, o horos einai yia sena!" ("You must dance!"). With that, I went with Eva to Delphi to participate in the 25th Anniversary of the Sikelianos' Delphic Festivals. Eva prompted me to study Greek tragedies and I worked in the tragic chorus of Oedipus with Katina Paxinou and Alexis Minotis. Later, I joined the Dora Stratou ensemble Panegyris for Eva taught me, "If you want to find the key to Greek tragedy, learn the Greek dances, because it all evolves from there." Exploring the roots of Modern Greek dance in the ancient Greek culture is an adventure in itself. Evidences of a connection are found in the popular rhythms in Greek dances today. They are the same 7/8 and 5/4 rhythms discovered in ancient poetry. In the Iliad, Homer wrote about a wedding dance where brides singing wedding songs were led from their homes up through the city by the light of flaming torches, while young men danced and whirled to the sounds of flutes and lyres  this scene was depicted on Achilles shield. Homer also mentions the Syrto dance in his writings and dozens upon dozens of references to dance are found in ancient texts from Lucian to Epaminondas. Ethnomusicologist Fivos Anoyannakis tells us, "Musicological research revealed that ancient Greek rhythmical formations live in the modern Greek melody, as demonstrated in the 7/8 time found throughout Greece, is none other than the heroic hexameter in which the Homeric epics were recited." In his book on Cretan music, Georgios Hadzidakis translated a short passage by Homer describing dance. In it, King Alkinoos extends a graceful gratitude to a stranger visiting his island (Odyssey, Book #8, Lines 261-265). Sadly, the video camera didn't exist then, otherwise we would have an accurate record of what the dances were like. However, there is art  statuary, vase painting, and bas-reliefs  and they give us an indication and a fleeting glimpse of movement. However, folklorist Rena Loutzaki said, "Great care must be taken in evaluating the significance of archaeological finds. Artistic representations depict a static moment in which dimension does not exist, and we have no way of knowing what came before, or what will come after." Some scholars offer the supposition there was a break in Greek culture from ancient times to the present because of invasions and occupations, yet the language remains the same and various other aspects of Greek culture also bear great similarities. True, the ancient Greek language is not easily comprehended today, nor is New Testament Greek, but there is continuity: it is still the same alphabet, same syntax, grammar, and many words are the same. Even today's English is not the same as Chaucer's or Shakespeare's English, and we are only talking about three to four hundred years' worth of time difference. The theory that over the past two thousand years multiple invaders may have altered the physiognomy of the Greek profile is countered by numerous examples of Minoan frescoes showing wide-eyed slim-waist maidens of Knossos that strongly resemble the faces of young women in Crete today. The argument against an ancient link with Modern Greece is often politically influenced, such as when the German philosopher Fallmerayer imposed his theory on the European community. He believed that due to the multiple invasions of Slavs and Albanians, the Greeks ought not to lay claim to ancient racial origins. This opinion served the political interests of the time when the new nation of Greece was formed, and is how we inherited the Bavarian King Otto. Many attempts have been made to return to the earliest recorded history on Hellenic soil and connect it with what is happening in Greece today. Modern Greece is a complex nation with a yearning desire to link culturally with its celebrated past. Over the past two thousand years there have been many occupations of Greece, the most recent ones being the Ottomans, the Franks on the islands, the Venetians and British on the Ionian Sea, and the Arabs in Crete. Despite all the cultural influences exerted by these occupations, did the music and language change? Did the orthodox religion survive? And if so, then why not dance? In early societies, dance derived its importance from its function as an integral part of social and religious life. The feeling of being part of a larger unit grew into group customs and dancing started to reflect human circumstances, by expressing emotions that regulated the consciousness of man's identity. Early Greek dance was most likely done on the "chorostasi" (threshing floors), a circular paved area where the wheat was harvested. A charioteer stood on a flat board, underneath was assembled stone to thresh and separate the wheat from the chaff as he was pulled around and around by a horse with blinders. After the harvest, it was time for celebration, and only natural to clear the space of the circular threshing floor and celebrate with dancing. The circle  a key factor in early dance  is recognized as a universal symbol conveying infinity. Dance is often identified with other universal symbols, such as the sun and the moon. The threshing floor was called "orchestra," named after the Greek word for dance "orchesis". In time, the orchestra became the focal point of rituals and festivities leading to the birth of Greek tragedy. The earliest "folk" dances executed in this area continued to develop into dramatic dance-songs known as the dithyramb, and eventually through use of antiphonal singing  a statement and a reply  brought about the form of dialogue and character which Thespis introduced. The early threshing floors evolved into the amphitheater with the circular space (orchestra) used for the tragic chorus adopted as part of the Greek tragedy. There is evidence supporting a cosmic element in the dance of the dithyramb. In a fragment of Ptolemaus, the cyclic chorus portrays "the movement of the sun." As researcher of Greek culture Lillian Lawler said, "Greeks believed that movements of heavenly bodies constituted a cosmic dance," and Lucian, who has written extensively on the dance said, "It is possible that any pattern in the dithyramb was probably not native to that dance, but may have been borrowed and absorbed into it from other dances. Like many other aspects of culture, dances are often the product of a fusion of originally discrete elements." These first enacted dithyramb rituals were derived from primitive "folk songs" which in turn developed a story line, becoming dramatic works in reverence to the god of wine and fertility, Dionysos. As an inherent part of Greek tragedy, the chorus is expressed with antiphonal singing and dancing simultaneously creating the beginning and foundation of theater, as we know it in the western world. Theater to the Greeks however was a place for spectators; the kernel of dramatic action took place in the orchestra. Remnants of antiphonal singing and dancing remain in Greek dances and the Greek orthodox liturgy today. Many of our Greek folk dances still thrive in the countryside and until recently, were also executed at the "alonia" (threshing floors). Another link between folk dance and Greek tragedy is that folksong before the sophisticated dithyramb was known as "goat song." In Greek, the male goat is called "tragos" (tragos and ode = tragoudi), the Greek word for song. The veneration of the male goat came about due to its prolific sexual potency and it became a symbol of fertility. Eventually the word tragedy evolved. 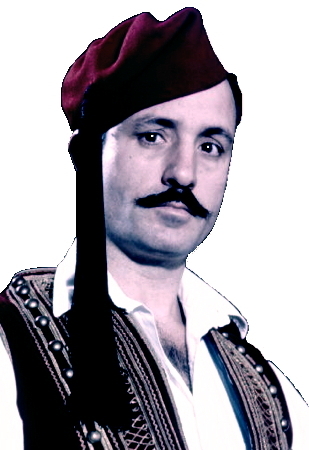 Fivos Anoyannakis wrote, "Musicological research has proved rewarding in the domain of the Greek folk song. It has unearthed valuable evidence linking Modern Greek folk song to ancient Greek music . . . further evidence of the relationship between folk song and ancient poetry and music is the derivation of the words "traghoudi" (song), "traghoudo" (to sing), from "traghodia" (tragedy)." Today the folk songs of the countryside still reflect antiphonal singing in their dances, especially in processional dances, when a leader will sing a verse, which the chorus repeats. The early church music also used chanters answering antiphonally with one another, evolving into today's choir. It is believed that in the earliest temples, the congregation danced and sang the liturgy. From this evolved the chorus leader and later, the priest. These early choruses or "Omadikoi Horoi", evolved by having the closed circle break open to allow for a leader. In her book on the ancient Greek dance, Lillian Lawler speaks about the circle, a sense of incorporating giving, receiving and excluding, "Circle dances and especially those with clasped hands have a mystical significance among ancient people, often performed around an altar, a tree, or a pillar or some sacred object, or even a musician . . . At times the circle dance seems to have been an invocation dance, as can be seen in ancient Minoan coins or frescoes in the Minos palace in Knossos." In her earliest experience in Greece, Isadora Duncan described hearing a boys' choir singing country songs and how it reminded her of an ancient chorus. When she visited the Greek Church and heard the plaintive chants she was reminded of the hymns of Apollo and Aphrodite and how all the pagan gods had found their way through transformations into the Greek Church. There are solid claims that in the formation of its rituals Christianity built on the foundations of earlier cultural forms already functioning. The early Christian churches were built on the foundations of the abandoned ancient temples of Zeus and Apollo. In the same way, ethnomusicologist Sotirios Chianis finds that the musical traditions of classical Greece are the formal foundations of contemporary folk music. "The chant heard in Byzantine musical traditions bear great similarity with the wailing klephtic ballads heard in the countryside. If we were to listen to the chants without having any comprehension of the text we would not be able to decipher which is religious and which is secular." Professor Psachos, a Byzantine musicologist who worked closely with Anghelos and Eva Sikelianos in the Delphic Festivals, said, "Greek music is subordinate to language; it has always been considered, both by the ancients and by the Orthodox Church as having properly no independent existence. Its function is to enlarge and enhance the word, to make the greater meaning and emotion inherent in the word distinctly comprehensible in very large churches, or in the open air." We therefore look to early dithyrambs as the predecessors of the tragic chorus and know that these dance-songs (folk dances) were performed and bear similarity to Byzantine music. This is believed to have been the forerunner to the secular form of singing and dancing. The dithyrambs derived from the word "Thriamvos", or "Di-thyramvos", refering to a devised dance step, a choral song with a story in honor of Dionysos, with a tragic chorus believed to wear goat masks and goat tails. As Nilsson says, "The worshippers of Dionysos, having slain the god in a goat form, the men dressed in the goatskin's and lamented him and thus tragedy rose from these lamentations. To this day in the village of Viza in Thrace a ritualistic slaying and resurrection is celebrated, as an agrarian magic connected with Dionysos. In the village of Sohos in Macedonia, and on the island of Skyros similar reenactments take place during the annual Carnaval, men adorned in goatskins and masks parading in the streets dancing and dangling bells to rouse the spirits." From free style and improvised "dance-songs" poets like Arion started writing lyrics and taught them to the "Choreutai" dancers. This came about in the 7th Century B.C.E. and later developed the "Koryphaios" or leader of the chorus according to Lillian Lawler. These choral songs may have been rhythmical movements or gestures known as "cheironomia", also related to the "strophe" and "antistrophe" (an offer and response) similar to what we find in the folk songs today, and also in the two chanters used for the Greek orthodox liturgy. There have been mentions of choruses slapping or hitting parts of the body, again bearing similarity to what we observe in Greek dance today. Dance as we now know it was transposed from the ritualistic observances, to the tragic chorus by way of the dithyramb, and after the contents of tragedy and comedy, the basic forms in their salient expression remained a secular exercise for the "folk." With the decline of the pagan gods and the emerging new religion of Christianity in Greece the transformation of faith and the manner of observing was transferred, but the forms remained intact. They were not worshipping Dionysos or Zeus, but the seasonal celebrations were still honored. One of the earliest pioneers of Greek dance, Haralambos Sakellariou, writes, "In Olden times, the worship of the gods required priests and youths and maidens should dance. Today after the liturgy in the church, the feast of the Virgin Saint is honored by dancing youths and maidens, for the dance as the Greeks feel it is a national tradition; a spontaneous and natural art. Through the ages it may have suffered slight changes, but the composition and broad lines remain the same: Plastic, pure, and sober, like the mountains and the shores of Greece." Greek mythology weaves a wonderful tale about how dance began. Before man, Titans inhabited the earth. Titan goddess Rhea, wife of the god Cronus, taught the art of dance to the Kouretes, sons of Earth who dwelled on the island of Crete, and to the Corybantes who lived in Phrygia in Asia Minor. According to legend, Cronus would habitually devour his children at birth so that none would succeed him. Rhea fled to Crete to give birth to Zeus in a cave on Mt. Ida. Cronus pursued Rhea and her baby and when he confronted Rhea, she gave Cronus a stone wrapped in swaddling clothes, which he promptly swallowed. Meanwhile Rhea placed the baby in the care of the Kouretes. In order to prevent Cronus from hearing the baby's crying, she besieged the Kouretes to dance wildly and noisily while beating their swords and shields. For this favor, Rhea honored the Kouretes by making them priests of Zeus and their descendants carried on their dances as cult rituals. The dances Pentozali and Maleviziotikos with their fierce noise making and leaping movements are believed to be evolved versions of the Kouretes' dance. Ancient Greeks believe that dance was divinely inspired. Plato said that dance arose from the natural desire of the young to move their bodies and express emotions  especially that of joy  or "hara", thus the word for dance  "horos". Others attribute the inspiration to dance came from a need to dramatize heroic deeds or perhaps mythological tales, or it may have come from the stimulation of wine, the gift of the god of wine Dionysos and the dance forms known as Bacchic (Dionysian) from Thrace and Phrygia. What where these dances like? All attempts to answer this question come from reconstructing information from ancient texts, mentions about dance in meters of poetry, ancient musical remnants, or archeological depictions in art, epigraphically, linguistic and lastly, any anthropological sources. The 7/8 Epitritos, the 5/8 Paionas, and the 9/8 Thochmios rhythms were known in ancient times and the lyrics did not always adhere to a set formula. This is much like the folk music we find in the villages today when the folk dancers sometimes keep their own rhythm, quite apart of the accompanying singers. Archeological sources can be convincing with statues or figurines of dancers, but they cannot give us an accurate representation of movement. There are numerous accounts about dance in ancient writings with detailed descriptions, but these are deceiving as dance is a kinetic art. In both the Iliad and the Odyssey, Homer mentions dance, but he evokes feelings and attitudes rather than describe movements. Lillian Lawler tells us, "Perhaps no gesture is depicted in Greek vases. It is seen in representation of "Revel" dances, funeral dances, and Dionysian satyr plays." Inscriptions found in Delos mention the Geranos dance where people holding torches most likely danced at evening ceremonials. This dance movement imitates the winding path of a serpent and the inscriptions suggest that the dancers carried garlands. Most believe the Geranos dance was linked to the Minoan folklore tale about how Theseus found his way with the help of Ariadne through the labyrinth maze after victoriously defeating the Minotaur. The Tsakonikos dance in Tsakonia, Peloponesus reminds us that Peloponesus' earliest settlers were Minoan. Animal worship was also evident in ancient Mime dances, such as the Tauromachia or "bull dances" in Crete. Pollux mentions the Morphasmos an imitation of animal movements, and Athenaeus mentions dance with "Morphe" images of animals in ritual tribute to a divinity, which degenerated into hilarity, that can be seen today in Carnival representations, especially in Sohos and Skyros. With the decline of Greek civilization, dance also declined from religious to festivals that in turn became more spectacular, losing their revered characteristics. Dance movements changed from sacred ceremonies to primitive rites. The Dionysian ceremonies became carnivals, the Bacchic dances turned into orgies, and dance was reduced to vulgarity. Lucian, Athenaus, and Pollux write of the lascivious hip swaying by courtesan dancers. In his symposium, Xenophon mentions toasting with merriment the flute girls and professional dancers. Many dances aligned to deities and rituals that once were ceremonial and processional swiftly went from hilarity to burlesque until they were shunned altogether. Lawler said, "There is a decline of artistic life and dance loses its strong characteristics becoming decadent and burlesque pantomimes. Christianity cuts off all ties with this lewd conduct, and even when Empress Theodora in Byzantium, an actress-dancer and a famous courtesan, goes under the influence of Justinian, finally brings another firm closed chapter for dance in Byzantium." turn our feet and set our gray heads tossing? we have joyfully forgotten that we are old"
In the Eleusinian mysteries, tributes to Demeter and Persephone were borrowed from Phrygia and Thrace as mentioned in the Thesmophoria and a degree of self-mutilation by the Corybantes had become popular in the Thronismos that caused Plato to denounce them. Professor Harisson mentions that ancient spring rituals were agricultural rites celebrating the rebirth of the Earth. Today, we associate rebirth with the Easter rite. Christ is laid in the tomb to be resurrected much like a similar pagan rite of Osiris in ancient Egypt. Villagers in Greece still feel these rites affect the world around them. Nilsson tells of a young Greek man he observed who was despondent, and when asked why, he responded that if Christ is not "raised" we shall have no corn this year. There is an ancient ritual where Greek women celebrated springtime with the death and resurrection of Adonis who was enamored of Aphrodite. In an improvised bier they would rest a facsimile of a handsome young lad and decorate it with garlands and flowers, which became known as the Garden of Adonis. Who dared to cut and mar your roots? What have you done my lad? with its Christos Anesti! Rise, Rise up my dear Zafiris . . ."
In folk dance, there are ritual movements connected with tilling the soil, harvesting crops, and periods of drought. There are carnival celebrations and soil fertility rituals during the twelve days of Christmas. Many rituals celebrated today are hidden in religious holidays. For example, starting with Lent there is Cheese Monday in Thrace when they celebrate the Kalogeros, a folk playlet assuring villagers of a good year and harvest, as well as prosperity for their herds. Some years ago I was told about a great "panegyri" (festival) in a rural area on Mt. Ilikon outside of Thebes. It was to take place on August 15th, the Feast of the Assumption of the Blessed Virgin Mary. People began to gather on the eve before and after the morning liturgy in a modest chapel the celebration began. For two days, there was eating, drinking, and dancing. In dance, there is an overwhelming desire to free the spirit from the body in an earnest pursuit to escape the drudgery and sorrow of everyday living. As the celebration continued, they were no longer in a line dance, but were whirling and circling to the steady beat of a Kageli dance. They took the small thick "retsina" glasses in their hands and clicked them together like castanets. When I asked what was this dance was called, they laughingly remarked, "It is a cannibalistic dance." As Loutzaki once said, "Traditions continue and are passed down from generation to generation, but with time barriers among regions have also broken down and that the cultural purity is no longer maintained, as there are cultural infusions and crossover and changeover from popular participation." Another remnant from ancient Dionysian cults that continues on to this day is the "ANASTENARIA." It is now celebrated on St. Constantine and Helen's name day. Anthropologist Katerina Kakouri tells us that dancers hold on to venerated icons in order to help induce them into a wild ecstasy so that they can dance barefooted on burning coals without injury. The ceremony concludes with the slaying of a young bull from which a special meal is prepared for all to partake. On a visit to a late-night taverna in Athens, I once saw a young man dancing wildly to a soulful Zeimbekiko. After breaking dishes and tossing chairs about as a way of showing that material things were of no consequence, he grabbed a bottle of brandy, poured it in the area he was dancing, and lit a match setting the dance area on fire. As he leaped in and out of this fire, I was reminded of how ritual dance is utilized to express emotions. In her book Sacred Dance, Maria Gabriel Wozien said, "Ecstatic liberation of the self was sought in Dionysian dances. Ecstasy akin to sacrifice emptying the body and allowing the god to enter. Dionysos sacred madness took hold of women into the "MEANADIC" Madness." There are several insistences of ancient dances that still survive in contemporary traditional Greek life. The Keleustes  an ancient dance for oarsmen  is similar to a traditional song for sponge divers on the island of Kalymnos who, in a heaving song Dirlada, pull the oars in a rhythmic pattern while singing. The ancient dance Pyrrihios is associated with fire by its very name. This is one of the most referred to dances of ancient times. Fire portends movement whether it is the fire from within the dancer causing him to dance wildly, or the external open fire that he dances around. It is classified as an orgiastic dance with Dionysian roots. These dances emphasize earthiness and downbeat heavily accented by rhythm and percussion. The string and wind instruments emphasizing melody are more akin to spiritual harmonics representing the Apollonian aspects in dance. A perfect example of the Dionysian and Apollonian forces evident in dance is the Tsamiko dance from Tsamouria, Epirus, depicting a reenactment of a battle. The dance begins with a military cadence, like a march, a heavy beat depicting preparation for combat. Through numerous calculated and improvised movements, the leader expresses vigor, power, and strength. He falls to the ground as if wounded only to rise leaping in the air, victoriously overcoming his wounds. This dance gained great prominence during the War of Independence, when Greek brigands hid in the mountain peaks preparing to confront their Turkish oppressor. The warriors gathered around a fire singing songs of freedom that incited fevered dances. The dance reminds us of a fire within the dancer shown by energetic acrobatic feats. Due to its popularity when the new nation was formed, it is believed that the Tsamiko is a dance of the 1800s but it is a wonderful example of a dance with ancient roots and a strong presence throughout history with a vital presence to this day. For the dancers in a line dance, it is the leader who executes multiple actions expressing emotions, often sharing the lead with others each one interpreting their own feelings. In the Tsamiko, the lead dancer reenacts a battle, swinging his arms and slapping heels as if he were a warrior with a sword. Even though the sword is no longer a relevant weapon of warfare, the dancer still demonstrates the need to overcome an oppressor visible or invisible to assert victory. Currently, the Tsamiko dance is no longer the sole domain of the Greek villages. Urban settlers also respond with equal fervor to make this dance not just an empty exercise, but rather a dance with a psychological function articulating the need to overcome obstacles and demonstrate victory for survival. Music speaks to us to dance, while the lyrics relate a story, which the dancer enacts. The motions are not to "show off" but rather to be liberated from whatever oppression or suffocation he or she feels. The Moirolighia (dirges), which found their way from the wailing sounds in the tragedies into the folklore commemorate the death of a loved one, became famous in Mani where professional mourners were hired to induce tears among those present to cleanse their emotions. Such woeful inspiring poetry soon found its way into the Tsamiko dances as an eminent folklorist of another era said, "Serving as a soldier in the Balkan wars I witnessed one of these moirologhia (a kleftiko) danced by the Evzones of the Greek Light Infantry. They had just gone through some heavy fighting. Out of some 800, hardly 50 were left. Their beloved Commander, whom they called O Mavros (the Black One) was among the fallen. When night came, they laid their fallen chief on a platform made of branches and leaves, and lit fires all around, and started singing and dancing their kleftika moiroghia, a scene of savage poetry enacted on a Macedonian mountain peak." Occupation and wars prompted the creation of some famous dances such as the Horos Tou Zalongou of 1803 when the women trapped in the hills of Zalongou  while singing and dancing  threw themselves with babies in their arms over the cliffs rather than surrender to the Turks. In Naoussa, Macedonia, a similar incident occurred at the well known as Arapitsa, and in Halkidiki, "Ierissos", the "Famous 400" brave men, danced the Kangeleftos as they passed under an arch and were beheaded by the Ottoman Turks. Once a year, in the village of Moniklissia in Macedonia they celebrate the ritual of Gynecokrateia. The women take over the whole town, all political offices, the mayor, the judges, the police, and all civil posts. They lounge at the coffeehouses, playing backgammon and cards, talk politics, and when they catch anyone misbehaving he is taken and locked up in the local jail. In ancient times this was known as Thesmophorea, a three-day secret fertility rite in honor of Demeter and Persephone where the married women established their own laws and was portrayed in the famous Aristophanes' comedy Thesmophoraizusae. This Ethimo, or custom, often reveals prejudices or even deep superstitions. The American historian Lewis Mumford said, "That despite its outcome, custom tells us who we are and where we're headed." Customs are our frame of reference. From ancient times, through several centuries of decline to the Akritans in Byzantium continuing traditions and customs connect Hellenism. Despite austere prohibitions brought about by the Christian religion during the Middle Ages, in the Greek countryside the Greek priest always began the Panegyri ceremonies by leading the first dance. We still have the Dance of Isaiah in the Greek orthodox wedding ceremony, simulating dancing around the altar. Greeks today still have not tossed the yoke of the Turk off their backs. In his novels, Nikos Kazantzakis refers to how Greeks still harbor feelings of intimidation. Early in my career, I was doing a Smyrneiko Ballos dance for a television show in New York. The famous music of Smyrna has a long tradition dating back to ancient Ionia, and it is also responsible for bringing the extraordinary qualities of music to the rebetika movement. As I was rehearsing to the wailing and longing sounds of the sea, the producer was offended, and quickly ran over, snapped the record from the phonograph, and smashed it saying, "How dare you condescend to dance to this oriental hogwash, what are you  a Turk? Don't you know any better?" What the producer forgot was that Greeks inhabited Asia Minor for thousands of years. Greeks were living there, running institutions, schools, commerce, and banks, as late as the 1950s, well beyond the massacre of 1922. Our great and wonderful Paleolladites of southern Greece, the first to gain liberty during the Revolution of 1821 and the founders of new Greece, did us a great service, but also a slight disservice. They considered anything north of Attica and Roumeli to be Slavic and foreign. It wasn't until the 1950s when Dora Stratou, believing that to remind the historic continuity in Greece, felt that we need to look to the traditions and customs of the Greek people. Within folk songs and dances we can find the living history whether it be to celebrate with joy or to cry and shed tears in our sorrows. By establishing a national folklore ensemble, Dora Stratou brought attention to the Greek dances evident in the provinces of Epirus, Macedonia, Thrace, Crete, and Pontos. Most of these areas didn't become part the new nation of Greece until 1912 and the Dodecanese islands did not join the Greece until after World War II, when the Italians turned them over to Greece as war reparations. It is of the utmost importance that these provinces and islands never severed their ties to Hellenic culture, language, religious traditions, and certainly not their dances. The Franks and the Venetians on the Greek islands introduced court dancing such as the Ballos, from the Latin word to dance ballore, but they didn't change the music, the rhythm, or lyrics, they simply danced their island Syrto in couples in order to imitate the court dances of western renaissance Europe. Greece exhibits a rare cultural identity due to its diversity, but despite many invaders and conquerors, be it from the time of the unification of Alexander the Great, Byzantium, or even the heavy-handed Ottoman Empire, the arts and language maintained a common culture. Many Philhellenes, who appreciated the Glory of Greece, and recognized the value and contributions Greek culture has made, also helped maintain Greece's cultural identity. So romantics like Byron, poet Shelley, painter Delacroix, dancer Isadora Duncan, and Eva Palmer Sikelianos, understood well the value of preserving Greek culture. One of America's greatest legends in modern dance, Martha Graham, was not a strict advocate of Greek dance, nevertheless her greatest choreographies fleshed out ancient stories and myths with a passion that became the pinnacle of innovative expressive movement for dance. Finding a kinesthetic response while doing a Syrto, or Tsamiko, or getting into the groove during a Hasapiko, we do not articulate our feelings verbally. The vibrations speak louder than words. And from it, we feel emotionally cleansed, relieved, enthused, and spiritually invigorated. When Zorba danced he didn't say, "Hey, watch me!" He danced to destroy the pain and anguish he felt when his son died, "For if I didn't dance, I would have burst." He snapped his fingers to his own inner rhythm just as the ancient poet Anacreon said, "When old age leads the dance his white hairs only tells his years, but youth is in his heart." Under certain circumstances a dancer may choose to lead, or may be selected by those in the circle, and in assuming that role he or she elects to improvise spontaneous choreographic steps within the form and the technique of the region. It is then that he momentarily becomes the "artist." These "moments" cannot be reproduced or reenacted, they live and die in that brief time, and what is important is that he or she is not "performing" but living and acting out the emotions and feelings of that moment. The motifs or specific movements that are copied or imitated rise out of the need for expression deeply steeped in the Greek culture encompassed within music and tradition. Greek dance teaches us how to remain human in this whirlwind of technology and the pursuit of material things. Today, the preservation of Greek dance is primarily through public performances. It is, in essence, a break in tradition. By bringing in external forces, which are unconnected with the life of the community, we have changed the characteristics and the relationship of the individual dancer to society and its culture. The idea of placing Greek dance on a stage reminds me of a philosopher who was an advocate of acquiring more and more books. His unique and massive collection lined bookcases along the walls of his home until one day they were so top-heavy that the bookcases collapsed, fell on his head, and killed him instantly. As Maria Gabriel Wozien tells us, "Ritualism, preserved by a priest-caste or a power group, who guard the outer form, regardless of changing times, or the needs of the developing individual, renders the sacred tradition a mere relic, a fossil. Merely surviving ritual is no longer alive: It is just a curious specimen of past human culture." Dance in any period of history will remain alive in as much as people continue to give it the respect it needs to survive, remain pertinent, and timely. Otherwise it becomes simply a symbol of its time and as Wozien also said, "When a symbol is made to have a finite meaning as opposed to merely being a paraphrase of the mysterious, an approximation to reality, then it becomes an idol . . ."
I have been involved in Greek dance now for more years than I even like to remember, and I welcome the gift Terpsichore bestowed on me. I feel exhilarated to see others join in with equal and even greater passion to ask questions and carry on the legacy of Greek dance. It is, after all, not an idle exercise but a meaningful art form that is valuable and evocative to the human spirit by connecting our history and our future. What I have hoped to touch upon is not to "reincarnate" our past but to awaken the communion we sense when doing a simple Syrto. Traditional dance is very much alive everywhere Greeks feel the pulse of that beat, and we keep it, not as a relic, but as a testimonial to an ancient link  a living heritage.